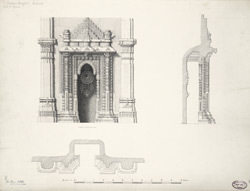 Illustration of mihrab showing front elevation and side profile from the Rajapur Mosque at Ahmadabad, in Gujarat from James Burgess' 'Original Drawings [of] Muhammadan Architecture of Ahmadabad.' The mosque of the wife of Sayyad Budha bin Sayyad Yaqut was constructed in 1454 and is one of the larger mosques in the village of Rajapur, south-east of Ahmadabad. The mosque's architectural plan is based on the use of five large domes which almost span across length of the prayer hall of 150 ft by a width of 53.5 ft. The central dome is raised, and from the façade of the building it is visible between the two minarets. One of these minarets along with an upper gallery was damaged by lightning. Along the back wall, there are five mihrabs or prayer niches constructed of marble and richly decorated.